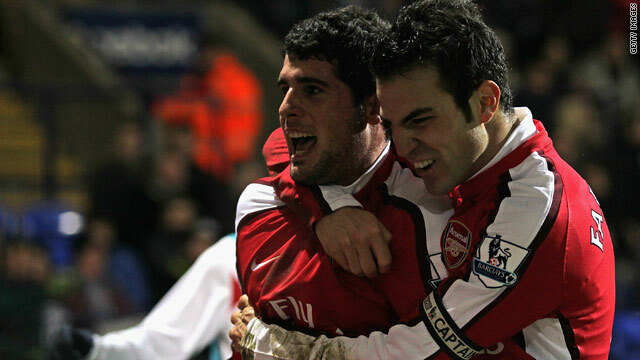 Arsenal goalscorers Cesc Fabregas (right) and Fran Merida celebrate their 2-0 victory at Bolton on Wednesday. (CNN) -- Arsenal moved to within three points of leaders Chelsea at the top of the English Premier League after Cesc Fabregas inspired them to a 2-0 victory at Bolton to spoil new manager Owen Coyle's first match in charge. Captain Fabregas produced an impressive display on his return from a hamstring injury and scored his 10th league goal of the season in the 28th minute after a neat one-two with Eduardo. His surging run then led to substitute and fellow-Spaniard Fran Merida scoring the second 12 minutes from time as former Wanderers player Coyle's reign at the Reebok Stadium got off to a losing start. With these two teams due to meet in the return fixture at the Emirates Stadium on Wednesday, Arsene Wenger's side could well take over at the top of the table in the next few days. Bolton remain second from bottom, with Coyle having swapped one relegation battle with Burnley for another. Earlier in the day, Blackburn captain Ryan Nelsen put the seal on his side's long-awaited return to winning ways as they overcame Fulham 2-0 at Ewood Park. Nelsen applied the finish to Benni McCarthy's 54th-minute free-kick to put Rovers within touching distance of their first three-point haul since November. Defender Chris Samba had earlier settled the home side's nerves with a fortuitous 24th-minute opener after he ricocheted home an attempted clearance by former Blackburn winger Damien Duff. In the day's other match, Aston Villa failed to cash in on slip-ups by their Champions League-chasing rivals after being held 0-0 at home by West Ham. Villa could have closed the gap on the top four after Manchester City, beaten at Everton, and Tottenham, held at home by Hull, both dropped points on Saturday. But a combination of a below-par performance and some fine saves by Robert Green meant they had to settle for their first goalless draw of the league campaign.